I'm not having it said for a minute that publicans are partly responsible for the state of affairs in binge-drinking Britain. Hold on. What's that? A pint of Carlsberg, Fosters, Carling or Best Bitter for a couple of quid? 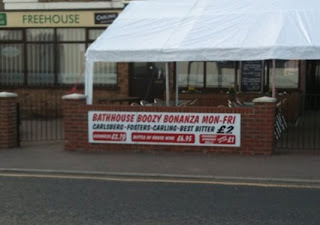 I'm off to the Bath House Boozy Bonanza to get 'em in.